You might be wondering what the "S" stands for. This much I know for sure… it's not Super, Special, or Sensational. Even Microsoft isn't sure if the "S" is for Streamlined, or if it's all about the "Soul of Windows." The goal of Windows 10 S was an environment that will only run apps downloaded from the Windows Store. You can't download or install software from any other source. It's basically a walled garden. The default search engine for Windows 10 S is Microsoft’s Bing and you can’t change it to any other search engine. Its default browser is Edge, and that remains the default even if you install another browser… which you can’t do because there are no other browsers in the Windows Store. Apparently, "S is for Store." The folks at Redmond tell us that your favorite desktop apps will run on this version of Windows 10, but they'll have to be re-packaged by the software vendor and listed in the Windows Store. And there's no guarantee that your favorite software will ever make it to the Windows Store. Does that sound like the software environment that someone who buys a $999-and-up laptop would want? No, it does not. So Microsoft will let Surface Laptop buyers upgrade to Windows 10 Pro for free during their first year of ownership; thereafter (if anyone can tolerate Win 10 S longer), an upgrade will cost only $49. Microsoft says Windows 10 S is aimed at the education market. K-12 schools that issue laptops to students must strictly limit what kids can download and install on said computers. Windows 10 S solves that problem; there’s nothing dangerous or scandalous in the Windows Store. Windows 10 S also comes with administrative tools that make managing hundreds of computers in a school environment easier. But at this time, the Windows Store does not contain any of the most popular software used in schools. Microsoft is competing with Google’s Chrome OS and low-cost Chromebooks in the education market. So why is Windows 10 S debuting on the Surface Laptop, which starts at $999? Microsoft's devices chief Panos Panay says the Surface Laptop targets students who are just about to leave high school. "We talk to a lot of them... they're asking for a laptop, they're asking for a Surface laptop," he said at the launch event. "So we built a laptop, and it's beautiful." The Surface Laptop is pretty, but I wouldn’t call it “beautiful.” It has a 13.5-inch screen, the thinnest LCD touchscreen even put into a laptop, according to Panay. The resolution is a generous 2256 x 1504 pixels. The screen is compatible with the Surface Pen, an option available separately for $40-60. But touch input will be awkward because you will have to brace that thin screen with one hand while tapping on it with the other. The keyboard area is covered with Alcantara fabric, which is easier on wrists and wipes clean easily. The Laptop weighs a svelte but not anorexic 2.7 pounds, and at its thickest point measures only 14.5 mm (about ? of an inch). Inside, the $999 model has an Intel Core i5 processor, 4GB of RAM, and 128GB of SSD storage. Ports are rather meager: USB 3.0, headset jack, mini DisplayPort, a 3.5 mm AV port, and Microsoft’s magnetic SurfaceConnect charging port. Other built-in peripherals include a Windows Hello face sign-in camera, front-facing 720p HD camera, stereo microphones, and Omnisonic speakers with Dolby Audio Premium. I don’t expect big sales numbers from this combination of Windows 10 S and Surface Laptop. No 18 year-old will stand for the restrictions imposed by Windows 10 S. And it makes no sense to buy a laptop and immediately upgrade its operating system, even for free. The K-12 market needs sub-$200 hardware, and Microsoft is promising a range of devices tailored for Windows 10 S, arriving this summer and starting at $189. They'll come with a free subscription to Minecraft: Education Edition, which is sure to boost productivity and encourage kids to focus on academics. Not. Most recent comments on "What (and WHY) is Windows 10 S?" As Maureen said: $999 for a school laptop? Which family has this kind of money to shell out for 1 Surface laptop, when others are available in the 3- 400$ range, and for the kids to have them in their backpack and then loose the backpack, that would be a real loss. Just think again on the Windows S 10. When they made the announcement they also showed a number of vendors who would be releasing a laptop with Windows 10 S on it. The whole intention for the product is the education field. Never seen so much negativity. I think we could all have a pretty good guess at what the "S" should stand for ! On the other hand one could just draw a vertical line or two through it ! I've been looking into getting a new computer and/or tablet and want to thank you for your timely information on the Surface and 10S. Oh, BobC, it's YOUR, not YOU'RE. It looks like something you would buy this WinS, I want to make sure it's not an update that I can't get rid of. Is it? I repeat a previous poster's question: Is this "upgrade" or ""update" going to automatically install on my computer? How can I avoid ANYTHING related to 10 S? 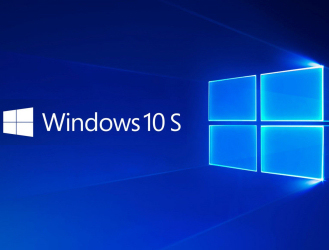 EDITOR'S NOTE: Windows 10 S will not affect current Windows 10 systems. No worries there. Bob, I know what sic means, and that brackets are normally used. Perhaps "logic" would have been better. If I'd done that, however, someone would have thought I was using the current usage of quotation marks to emphasize the word, instead of the original meaning of adding the silent adjective "so-called", as in "so-called logic." Deja vu! Sounds like a redo of the Surface RT from 2012 - only this time it includes Intel chips. At the time, Win8RT was criticized for its software ecosystem, the sparseness of the Windows Store, and its incompatibility with existing Windows software. I guess we'll see how long it takes for a hacker to 'again' get 3rd-party programs on Window$. My Win10 Pro system (Desktop PC not a laptop), has told me several times that "Windows 10 Creators Update" and that I need to get my system ready for it. I actually thought that this was the same as the "Windows 10 S" about which this article was written. Apparently not. WHEW! Re win 10S. Maybe GWX Control Panel.exe by Josh Mayfield may still be able to do the trick in preventing win 10S from down-loading. It worked just fine for me when MS was trying to foist Win 10 onto my rig. Steve. Why doesn't the education market just use Linux for free? Especially if you want a streamlined OS. Maybe "S" is for School. I did some previous reading from an article that leaked out about MS windows 10S. MS's main reason is an attempt to grab some of the market that Google/Google Chromebook has taken over. The fact that only MS Store Apps will work on the new MS device and with the Win 10S program is another bit of MS extortion and control. The Chromebook has some restrictions but overall it does everything one needs to do. And it has a few features that the MS Surface Laptop with Win 10S does not have. MS once again has missed the mark. Education institutions are NOT going to spend thousands of dollars on a system that is controlled and restricted to MS Store Apps only. That will eliminate the Open Source FREE programs that are available to download. So, bottom line for me, I won't be wasting over $1K for a device with so many restrictions. I will stick with the Chromebook which does everything I need it to do. I pity student who are forced to purchase or use the MS garbage. I am still a proponent of Linux which is a much more stable program and it is FREE. Although you can donate to the ITs who keep it up and running. I am still using Linux on my old Dell Desktop and it is working just fine. The "S" stands for Spy - "Windows Spy"
The Devil made me say that and I wonder the truth of it ? Microsoft has always been greedy, but this farce which they are attempting to perpetrate on the naive who may be confusing this with S = simple is grotesque even by their standards. I suppose if I were a 35 year old multimillionaire with a very bright five year old child I might set this up for my child as an "Introduction to Windows 10 computers 101". In two years he/she could then would be using a real computer with Windows 10 and I would either pass it down to a younger child, or if there none, donate it to the garbage since I wouldn't want the information on it going to somebody else and reinstalling Windows S, assuming that was possible would probably, knowing MS's infinite greed, require repurchasing all of the junk from Windows Store. Byron and Roger - you're both right. So you can only load apps through the MS Store, so what? Apple phones have forced users to go through their iTunes loop even to load outside apps or ebooks, and I don't see them struggling for market share. The real issue is, what delusional bright spark thought they could sell such nonsense, and what was their target market? When MS starts making business decisions like these, it is time to consider Linux. Just another liberal attempt to indoctrinate America's school children. One poster said there's too much negativity about Windows 'S'. Nope, not as long as there's a liberal left in the USA. Even Windows users become Windows haters, when no one has time to stop and smell the coffee. *When Apple decides for a change in their 'walled" eco-system and becomes territorial; no one complains. *When Google shows their own territorialism to lure you into their own [purely] money-making machine; no one resists nor complains. *When Linux expects too much undue user-hardship and lacks drivers for the majority of today's gadgets; it goes unmentioned. **But noooooooooooooo, when Windows tries to dump Win32/X86 structure from their own OS to fortify the brand's security hardness [via their new OS framework called UWP, et al]; even bloggers forget the real reasons that are NOT to hit users in the wallet but to provide a more stable platform than the above 3 competitors. I think there is a lot more to the "Here's what you need to know..." then you are letting on, Mr. Rankin. This laptop and O/S would be well used in a correctional facility. Better monitoring of use. Maybe some government officials too. Who seem to get in trouble on the interwebs. Ha!